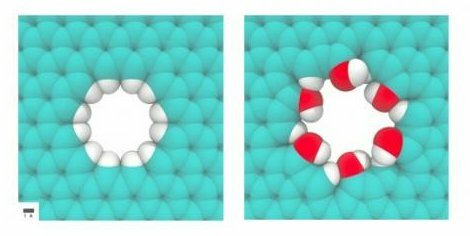 MIT scientists have shown (in simulations) that nanoporous graphene can filter salt from water at a rate that is 2-3 orders of magnitude faster than today’s best commercial desalination technology, reverse osmosis (RO). This could lead to more efficient and smaller water desalination facilities. The graphene is used as a membrane material that allows a flow of water with full salt refection via size exclusion. Other materials have been investigated for the same purpose, but the researchers say that graphene is the "ultimate" thin membrane as it's the thinnest one possible and as water flux across a membrane scales inversely with the membrane’s thickness. This is not the first research into graphene-based water treatment. 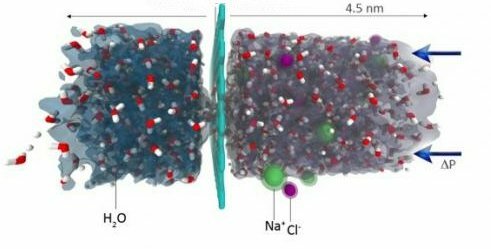 Back in October 2010 researchers from Australia and Shanghai have developed a Capacitive deionization (CDI) application that uses graphene-like nanoflakes as electrodes (CDI is a relatively new way to purify water). Earlier in 2010 Korean researchers have made a new type of composite material made from reduced graphene oxide and magnetite that could effectively remove arsenic from drinking water.